Looks like the H4 EAD approval is faster than COS to H4 at most of the centers . What might be the scenario if H4 EAD is under processing but COS to H4 is still pending? You will still have to wait for H4 COS to be approved before you can start using H4 EAD. I am planning to file H1 transfer in premium along with H4 COS from F1 and EAD. Do you think they will process all the applications together? I have already filed H4 COS separately and according to the current timelines I will receive it by April last week(filed it on Jan 2nd). I do not understand your question. You are planning to file H1B and H4 at the same time for yourself? How? No Anil. Its H1B transfer of spouse along with my H4 COS and EAD in premium. 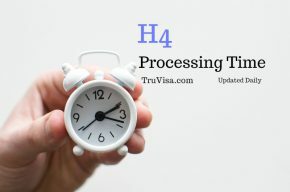 You can file H4 COS along with your H1B transfer but you won’t be able to get result for H4 within premium timeline of 15 days due to the new H4 Biometric requirement. It is better you keep your other H4 COS active if it is destined to get result by April. My F1 to H4 COS and H4 EAD received date is 15th November at Nebraska Center. When do you think my applications will get accepted? Also, thanks a ton Anil for these extremely helpful sites! You can expect your H4 COS approval anytime now at Nebraska service center. My H4 extension and EAD receipt date is Jan4 2019 at Nebraska service center. Do you have any idea how long I would have to wait. Thanks. You can expect your H4 extension approval by April 2019 end. Primary applicant, Petitioner and receipt number for Ds-160? Hello, I am currently applying for my H4 stamping in india. My H4 was approved while I was in the USA. Should I mention my receipt number on the form? and what should be primary applicant? me or my husband? You are the primary applicant of your H4 visa stamp. Your application is dependent on your spouse’s H1B. H4 petition was approved in US and not H4 visa. Visa stamp is given by US embassy which you are applying for now. I have added my case above and filed COS on Jan 2nd for H4 along with EAD. Is it better to wait or get H4 stamped from India and the apply for EAD? It is better to apply for H4 visa stamp from India and then apply for EAD. As this time, H4 COS is taking 10+ months easily. But the California center shows 4 months 15 days above. Also how are the chances of approval if we stamp in India? H4 chances of approval are good. It is probably the most safe visa to get. We filed h1+h4+ead renewal with employer A on oct26,2018 in normal processing. It went to Vermont. And h1 petition got RFE, we have submitted Response but attorney doesn’t upgraded to premium yet. My husband also got FT offer from employer B and applied h1(transfer) +h4 with employer B. Employer B upgraded it premium and we got approval for 3 years for h1 & h4. My EAD expires on April2nd and am working. 1. Can I make an expedite request for h4 EAD Renewal which i submitted with employer A with the h4 approval notice from employer B? You cannot send new documents for existing application unless USCIS issues an RFE and asks for them. You can file an H4 EAD expedite request but chances are very low that it will be accepted. Try with your local congressman and you may get lucky. Phoenix is just the lock-box address. USCIS routes the H4 EAD application to other centers after receiving them at Phoenix. I am currently on h4 status which expires by mid of march. My H1b petition filed last year is still pending with USCIS and am waiting for my decision. Now if I file for an H4 extension, will this effect my H1 decision? In case, i get my H1- b approved before my h4 extension is processed, will my h1 status be updated with H4? Please help me understand this as I dont want to run out of status or jeopardize my H1 application in anyway. It is better that you upgrade your pending H1B application with premium processing and avoid all other hassles of filing H4 extension. You will definitely introduce complications to your status if you file H4 extension now. Both H1B and H4 can co-exist and can reach result. But, the last application to be approved will take effect. H4 change of status is taking forever these days. Today’s processing time is about 13 months on average. The above mentioned processing times are updated every 3 hours after scanning USCIS official data and from other user driven forums. So, it is taking over an year to get status result. The faster way is to go out of US and get H4 stamping at US embassy. I applied for my H4 COS and H4-EAD together at California Center on 27th Sep. My current EAD is expiring on 27th January, 2019. What are my chances to receive my EAD before that? What are my options to expedite it? The chances are low to get H4 COS approval before 27 Jan, 2019. And H4 EAD cannot be approved unless H4 is approved. Thank you for the quick response. The current processing time is 4 month 14 days as above mentioned. so does it mean I should have my H4 by mid feb and than they will process my EAD? Did you receive your H4 and EAD? Hey did you receive it together or did it take time for EAD? How did you know your case got approved when online case status doesn’t reflect that? Thanks for sharing the case status and details.